This entry was posted on Thursday, September 15th, 2011 at 11:06 and is filed under Barack Obama, Election 2012, Politics. Time for Democrats to Panic? In a piece that has wider implications for the 2012 election, Democrat strategist James Carville suggests that Democrats should be in utter panic over the drubbing they took in Tuesday’s congressional special election for the 9th District in New York, vacated by Anthony Weiner. This particular election signifies the attitude of the electorate in a big, big way, and what it really demonstrates is the Obama has gotten the Democrats into serious electoral trouble. Carville is sounding an alarm to fellow Democrats, but it may be coming too late. Carville goes on to explain several strategies the President might employ if he wishes to save his Presidency, and win a second term, but the problem with his advice is this: The White House has painted itself into an ideological corner from which it cannot easily pivot without abandoning his fellow Democrats who have carried the water for most of his programs to date. Democrats are quickly realizing the only way Obama wins is to scuttle his fellow Democrats. At the same time, they’re looking around, noticing that in the name of their own self-preservation, they may well need to abandon Obama. It’s a sticky situation, and Carville and others know it, but now it really is beginning to show. The Democrats are in serious trouble, and it is becoming increasingly apparent that any Republican with executive experience can beat Obama next year. 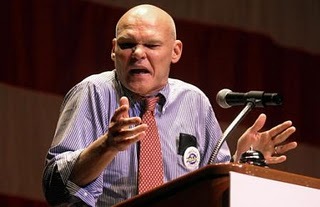 Some may now wonder if Carville will now be reported to Obama’s AttackWatch. 2 Responses to Carville to Democrats: PANIC!!! Someone needs to point out to Carville that we already have a crazy person running our nation. Democrats are coming apart at the seams because there are still enough Americans who understand that their ideas do not work, they never have worked, they never will work. The liberals have brought this country to the brink. Real live Americans are fed up and we're taking it back! Riding down a Texas dirt road, a guy looks left and sees a turtle atop a fencepost. He astutely wonders how the turtle got there, and concludes that someone placed it there. Barack Obama is turtle-atop-the-fencepost frontman for a progressive Alinskyite-Cloward-&-Piven oligarchy, intent on imploding capitalism and America and headed by George Soros. What the oligarchy might do is to replace the turtle with another.